DETAILS: This guitar once had a HipShot stringbender/drop D tuning mechanism attached. This was later taken off the guitar. It can be seen in the bonus DVD for "How To Dismantle An Atomic Bomb" during the Hanover Quay studio performance video of "Vertigo" and can be seen in various pictures from U2's November/December 2004 promo shows; including their live performance under the Brooklyn Bridge. USE: [studio] uncertain. [live] "Vertigo" during 2004 promo shows. 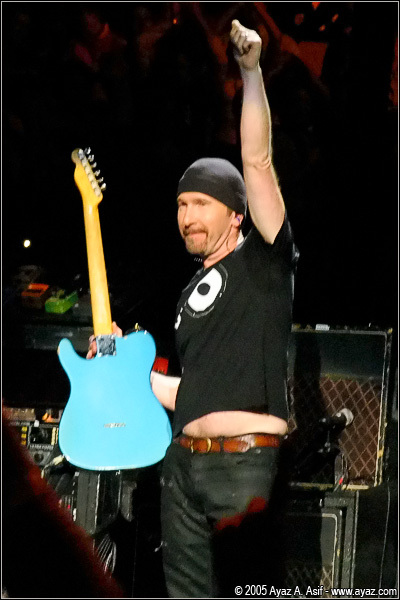 "Instant Karma during the 2005 Vertigo tour.